Hi its Deb again this week I wanted to tell all the ladies about our fantastic magnifying mirror for travel the MC449N it’s a very clever vanity mirror which doubles as a travel mirror also. We have a lot of customers who bought their wall mounted mirror use it, only to wish they could take their mirror with them when travelling and so they purchase the MC449 magnifying vanity mirror to use just when travelling. The best part about this travel size magnifying mirror is the size. With a large 14cm diameter mirror and doubled sided magnification being 10 x and 1 x it covers the best of both worlds. Apply makeup insert contact lenses the 10x magnification is in valuable because you can see nearly all of your face without having to move around and to have a quick check that your hair is all in order just flip over to the normal 1x side of the mirror. The MC449 magnifying Vanity and travel mirror fulfils both roles extremely well because of its design. Being as portable as it is the stand for the mirror is ideal to be set in any position to catch the light or get just the right angle. It can be set high or low in any fashion through the design of the foot on the mirror. Likely the very best part about this MC449 mirror is it can fold down flat and be put in its accompanying velvet bag and be taken with you on holidays. Many of our buyers tell us they never leave home on a trip without. It’s fairly hard to find a good mirror in accommodation places these days mostly they seem to have poor lighting in the bathroom and rarely do you get a magnifying mirror. Whilst there are other options on the market most of them you need to hold onto with one hand or they don’t fold down or worse still you need to suction them on the wall – they fall down, they leave a mark on the wall or you just forget to take it when you leave. 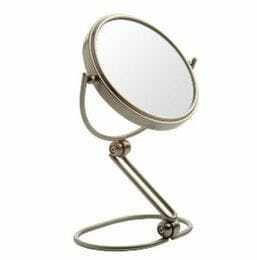 The MC449 magnifying vanity mirror has a nickel finish and if you have not seen this before it looks like brushed stainless steel. The best part is the nickel finish is it does not show fingermarks making it easy to keep clean. The size when folded down into the velvet bag is perfect and becomes neat and easy to pack in your luggage without taking up to much room. We do advise that when the mirror is folded flat before you pack it away to place a piece of cardboard or small piece of foam between the folding frame and the mirror surface this will prevent breaking or scratching the mirror. In the mean time smile :) and have a great week.